A group of people who survived Auschwitz and Birkenau, return to the main extermination and concentration camp set up by the Nazis, the site of their shared memories and experiences. Before their voices fade, they want to bear witness to the Shoah, shedding light on those places where their families and friends were annihilated. 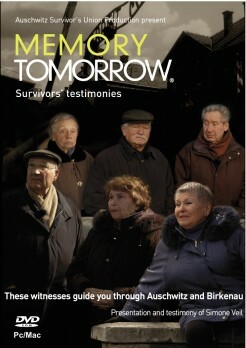 Memory Tomorrowshows 219 sequences of testimony, with a total viewing time of 8 hours. Computer-generated images, based on historical documents and the actual state of the buildings, bring us closer to the reality of the camps. They show the camps as they were at the end of 1944, as well as one of the Birkenau gas chambers-crematoria. An integral part of this project is to provide information and historical documents (both photographs and texts), including a folder useful for teaching purposes. Memory Tomorrow is a project of the Union of Auschwitz Deportees- France, produced with the support of the Foundation for the Memory of the Shoah and the City of Paris.